This winter, Soarex, a NASA sounding rocket, will be launched into space with XBee on-board. 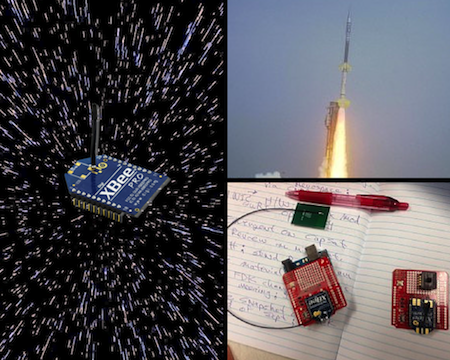 The three-node network is the first XBee Zigbee network to go to space. The rocket will fly roughly 200 miles above earth to test a new parachute-like technology called an exo-brake. Exo-brakes are used to safely return samples from the Earth’s orbit as well as land spacecrafts on other planets with much thinner atmospheres than Earth. Typically the sensor devices collecting atmospheric readings are connected with wiring, but the team chose to move away from traditional wiring and experiment with a wireless network. They decided to use XBee for a number of reasons. For one, less cabling on the spacecraft means less weight, which reduces the amount of fuel needed to fly the rocket. Another important feature is the ability to relay this data back down to earth via an Iridium satellite. The Soarex will monitor six different acceleration parameters as well as temperature and air pressure. This wireless network is part of NASA’s effort to test the performance of wireless networks on a spacecraft and determine if it’s suitable for other applications. Due to the high cost associated with launching a rocket, the team must be extremely conservative when implementing new technology. Once the network performs multiple successful trials, the team will incorporate XBee into more and more vital missions. When NASA chooses to experiment with new technology, the initial budget is relatively small, so the engineers went with off-the-shelf components to build out the network. The team is working with Digi’s XBee ZB modules, Arduino microcontrollers, and Sparkfun’s XBee adapter shields. If the trial run is a hit, they’ll work to build a more customized solution– one that might even feature the XBee Plus! Soarex will launch with XBee in January 2015. We’ll share some more information and let you know how it goes, so check back in! Until then, check out this video to get an idea of the wild ride XBee will be taking.